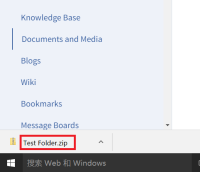 The file downloaded when attempting to download a Documents and Media folder does not have a .zip extension. File should have a .zip extenion when downloaded. File does not have a .zip extension when downloaded. Issue is fixed in master.